it's a harley, jim. . .
...but not as we know it. Harley Davidson, purveyors of fine motorcycles since 1903, aren't exactly renowned for their revolutionary mechanical changes. And while they've got the sort of customer loyalty that lesser brands (and by that I mean any other brand) would kill for, you have to accept that as being perfectly reasonable. And yet there are still the occasional grumbles, usually from the press, about the necessity for that much 'character' being retained in a bike which was supposed to be a twenty first century product. You can argue the rights and wrongs of traditional character versus modern engineering until the cows come home, but it seems that normally there's no place for the two to live side by side. Until now, anyway. 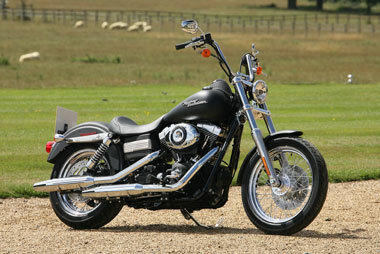 Because with the 2007 range Harley Davidson has taken the established rule book and thrown it out of the window. Now before you start getting all agitated, let's look at what hasn't changed. Harley Davidson haven't got to where they are in the marketplace by being daft. And it would be daft indeed to alienate their core customers or to turn their backs on the very qualities that have put them where they are today. 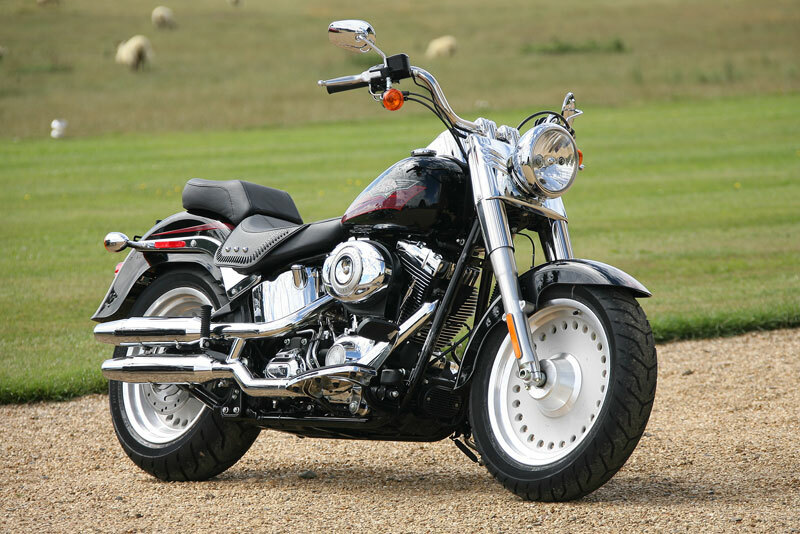 So Harleys are still big, they're still vee twins, they still have acres of deep, quality chrome and they are still the benchmark against which all other bikes in their sector has to be judged. In fact a casual observer would be pressed to notice any difference at all between a 2005 and a 2006 model, because cosmetically there's not much to see. And that's a Good Thing, because cosmetically there's not much needed changing. So what has changed then? Rather a lot, actually. There's something we need to establish first, though. In essence there are three flavours of Harley Davidson. There are Sportsters, which have a 1200cc or 883cc unit drivetrain, there are VRSCs - the V-Rod and Street Rod range - with their totally different liquid cooled engines and there is the Dyna, which covers everything else. But as the changes mainly apply to the Dyna rage, so we'll stick with that for the moment and look at the others later. 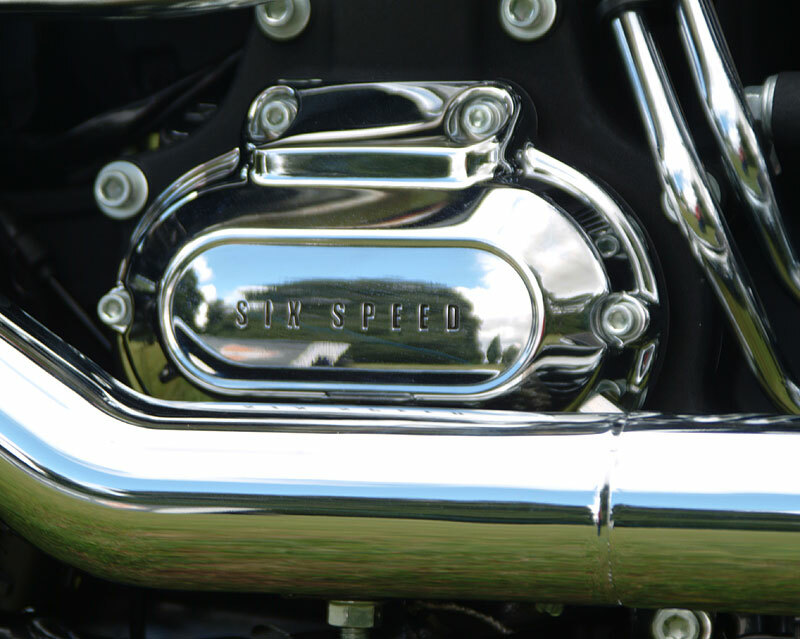 The Dyna Harleys all share the same engine and drivetrain. A separate engine and gearbox, linked by a primary drive chain and essentially unchanged in decades. But now there are major changes across the range, starting at the induction end and finishing at the back wheel. All Harleys are now fuel injected and have an ingenious valve in the inlet system which is part of their active intake and exhaust. More on that in a bit. Engines have grown from the previous 88 cubic inches to 96 cubic inches. That's 1584cc in real money. It may look the same but there are 700 new parts inside, despite the fact that the extra capacity is just gained through an increased stroke. There are actually two versions of the engine, both externally identical. The softails get a rigidly mounted engine with balance shafts while the others get the unbalanced engine in elastic mounts. It seems that customers who buy the softail prefer a rigidly mounted engine. The exhaust again has a valve in it to complete the active exhaust part of the system, and the whole thing is Euro III emissions compliant. Which is quite an achievement. The active inlet and exhaust is a neat idea. At first you'd think it was a power valve but in fact that isn't the case. No, the valve is controlled by a processor which notes your speed, throttle position, revs and gear and decides when you're probably in town. At that point it closes a couple of flaps and makes the bike quieter and so less intrusive. Outside those parameters the valves are open and you get the full Harley experience. I'm simplifying, but that's the general principle. It's a neat way of addressing the complaints people make about noise while not robbing the owner of one of the biggest features of Harley riding. But the biggest change is the gearbox. New for 2007 is a silky smooth six speed unit. Yes, I did say silky smooth and no, my tongue is not in my cheek. In a full day of riding a variety of bikes I suffered not one missed gearchange. I also got used to changing up and down without the clutch. The box is easily as good as anything from Japan, and is frankly a revelation. Ally it to a clutch which feels as though it belongs on a 2 stroke moped and you get a machine that's ever so easy to live with in town. The sixth gear gives a 1:1 final drive ratio and has a little indicator light on the speedo to tell you it's engaged. It isn't really an overdrive but it is quite long legged. Right at the back there's a new carbon fibre based drive belt which is 30% narrower yet stronger than before, while numerous chassis tweaks have been brought in to further improve the experience. To help you hang on to your Harley, there is a new handsfree security system which relies on proximity of the keyfob to arm and disarm. It's about as simple as you can get and seems to work quite well. Right, enough of the presentation and on with the riding. The test route was an inspired selection of sweeping A roads and tight, twisty country lanes. Mother Nature and Leicestershire County Council had conspired together to liberally scatter gravel, animal droppings and bits of tree around the route while the local farmers kept things interesting with hedge cutters and tractors a-plenty. 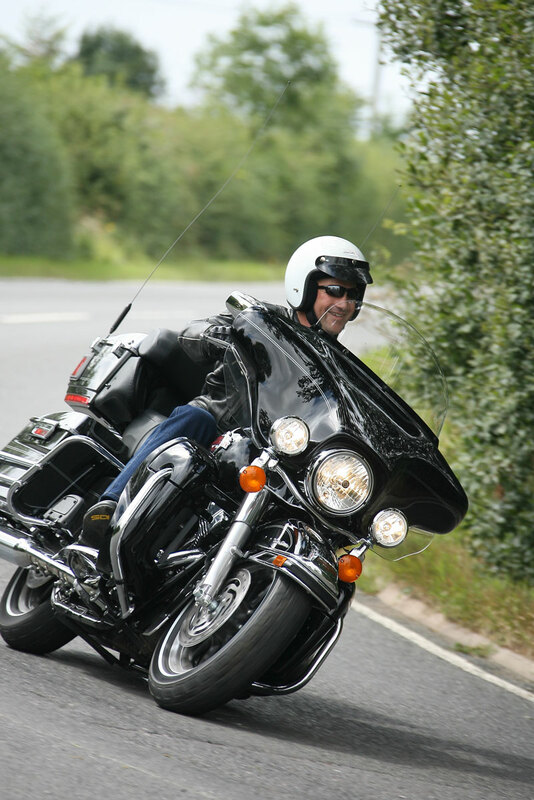 Choosing a route with at least two hairpin bends was a brave choice by Harley as getting large, heavy and somewhat slow steering machines round slow tight bends is never going to show them at their best. But perhaps that was the idea. I rode just about every model in the Dyna range over the same fifteen mile or so test route (I chose to stick to the same route so I could compare - there were options) and not once did I find myself wishing I was on something else. Yes there were places where a sportsbike would have been quicker or where a supermoto might have been more appropriate. Having got lost the first time out (one of the signs had blown down) and ended up in town, perhaps a scooter would have been better. But the overall experience was fabulous. The new engine feels strong and revs out nicely, though to be honest I didn't really manage to spot that much of a difference over the 2006 model available for comparison. Not because the difference isn't significant, but because the new gearbox masks almost everything else. You see before I'd get the bike into gear and rely on the engine to do the work, the gearbox being so intrusive. But now it's no chore at all to hop up and down through the box, so although there's noticeably more power and torque than before, you're using the box better as well so the overall result is little short of spectacular. The chassis revisions help, too. Though ground clearance is still an issue when pressing on - I ended up scraping footboards and pegs on almost everything I rode - there was none of the wallowing that sometimes accompanied spirited riding before and the scraping didn't seem to be about to upset anything. Brakes are better though definitely not up to sportsbike standard and planning ahead is the order of the day for enthusiastic riding as steering is slow but stable. I'm not a great fan of feet forward riding positions - it feels utterly unnatural to me - but despite that I found the bikes to be immensely comfortable. 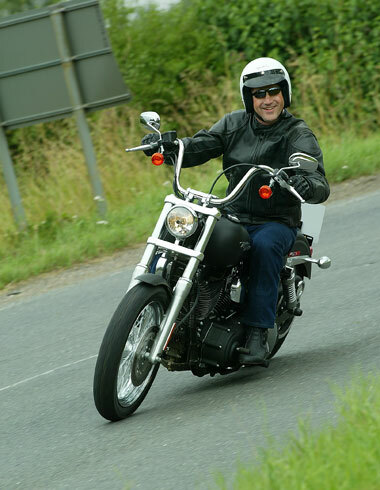 There are bikes in the range with a relatively normal riding position which suited me better, but it's fair to say that anyone will be able to find a Dyna Harley to fit them. Before we finish we ought to take a look at the other models in the Harley range. Particularly the Sportster, because that may well be the most important bike Harley make. 75% of Sportster owners are new to Harley Davidson, but an astonishing 80% of them trade up to another Harley with eighteen months. That says a great deal about just how good an introduction to the brand the Sportster must be. And it's going to be even better now as the entire range gets fuel injection and various other tweaks to make them all Euro III compliant and to make them more rideable. The 883, for example - the real entry level Harley - gets a whopping 15% torque increase which will easily address any criticisms that may have been levelled in the past regarding a lack of grunt. There are a lot of changes that have been made to the entire Harley Davidson range, and it's pleasing to notice that they have been done without sacrificing the core elements of what makes a Harley a Harley. They haven't added weight, either. The new engine weighs a pound more than the old one, but the new drive belt weighs a pound less. Overall there's virtually nothing in it. Not, I suppose, that the odd hundredweight really matters on a Harley anyway. But the real achievement is that these improvements have been made without an accompanying hike in price. In fact, on average, a 2007 bike will cost just £300 more than an '06. Some models have no price rise at all. We're going to be testing specific models in depth throughout the year, so I'll sign off by saying that first impressions were very, very favourable indeed. Copyright © Motorbikestoday.com 2006. All rights reserved. Users may download and print extracts of content from this website for their own personal and non-commercial use only. Republication or redistribution of content, including by framing or similar means, is expressly prohibited without the prior written consent of Motorbikestoday.